The Tea Party-led shutdown of the federal government hasn’t opened a new era of paralyzing divisiveness in American government. On the contrary, the recent shutdown simply reconfirms a long-held trend in U.S. history, where certain factions of the country believe they have the right to nullify federal law. It’s no surprise, then, that the Tea Party Nullifiers hail from the traditional Calhounist strongholds of places like South Carolina, Kentucky, Tennessee, and others in the former Confederacy. 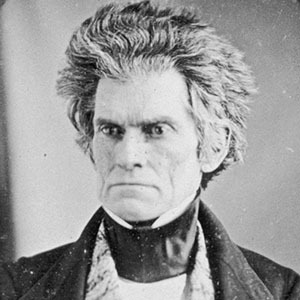 The first and most famous major upheaval of nullification involving these states occurred in 1832, when Vice President John C. Calhoun, a South Carolina native, decided to support his state’s Ordinance of Nullification, which declared two federal tariffs null and void within the borders of the state. This, of course, was all despite the fact that the tariffs were democratically passed by the House and Senate, and signed by the president in the normal manner prescribed by the Constitution. But the idea that the South has a right to nullify democratically-passed laws with which it disagrees did not begin in 1832. A generation earlier, the nation witnessed the Kentucky and Virginia Resolutions of 1798, which declared that the two states had the right to declare federal law unconstitutional. In this case, the Resolutions opposed the democratically-passed Alien and Sedition Acts, which were voted on by a majority in both houses of Congress, and signed by President Adams. The recurring theme, then, is this: despite signing up for a Constitution that mandates majority rule, and the supremacy of federal law over state law, the states of the former Confederacy cannot accept majority rule if they are not part of that majority. We’ve seen this painfully many times before, most explosively with the establishment of the Confederate States of America following the election of Abraham Lincoln as president. We’ve seen it, too, in recent decades on critical issues like desegregation. Following the 1954 Brown vs. Board of Education decision, for example, the Commonwealth of Virginia unrolled its ”Massive Resistance” plan, which sought to directly defy, and essentially nullify, the federal goal of desegregating the country’s schools. What the Tea Party Nullifiers are doing today, therefore, is merely a continuation of a long tradition of state-led nullification of federal law. While this is no secession or nullification crisis, it involves the same actors, traditions, and demographics that have historically paralyzed the functioning of the federal government at critical junctures. Site contents copyright © 2019 Recorder Online	except as noted. All rights reserved. | 91 queries in 2.235 seconds.